A silica gel-bound, imprinted polymer for selective recognition of the diquat herbicide: 5,6-dihydropyrazino [1,2,3,4-lmn]-1,10-phenanthrolinium dichloride, is reported. It was used in the solid-phase extraction procedure, following liquid chromatography-differential pulse, adsorptive-stripping voltammetric (LC-DPAdSV) technique. 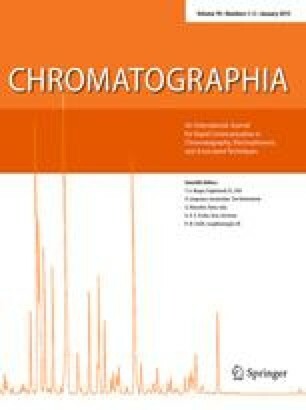 The operational conditions for 100% retention of the diquat herbicide on a chromatographic column (13.0×1.4 cm, adsorbent bed 1.0g) were realized at pH 6.9 and a flow rate of 5.0 mL min−1. The adsorbent used could be regenerated during elution with 5.0 mL MHCl within 20 min. The limit of detection was 0.65 nM (0.18 ppb) with an enrichment factor as high as 99-fold.